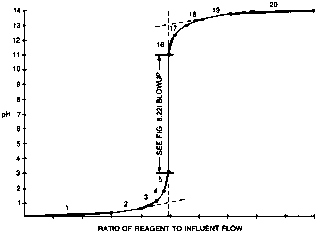 The dead-band or notch-gain controller attempts to compensate for the nonlinearity of the titration curve by matching a high controller gain with the leading and existing tails of the titration curve and a low controller gain with the steep center section of a titration curve. 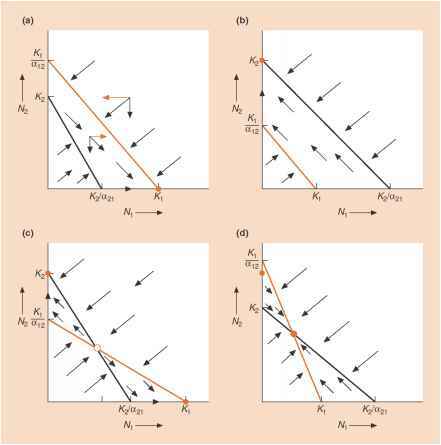 While this may appear to be a good fit when one looks at Figure 7.40.5, an expanded view of the region around the setpoint (neutrality) in Figure 7.40.6 reveals the inadequacy of the compensation. The nonlinear controllers also often assume the titration curve has a symmetrical S shape, which is not necessarily the case. FIG. 7.40.5 Overall titration curve of a strong acid strong base combination. FIG. 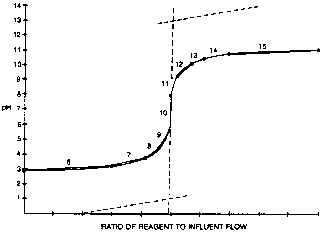 7.40.6 Expanded view of the titration curve in Figure 7.40.5.
variable. If the curve is constant and accurate, the process gain becomes 1. Combined with a linear final element and a constant feed, the result is a nearly linear loop. The curve can be adjusted for temperature effects. The pH setpoint also goes through the same line-segment calculation. The display for the operator can be kept in units of pH, by the use of an output tracking strategy which provides a dummy controller for the operator interface.